NOTE: Unfortunately due to demand the half price offer is now over, if you would like a reading please click here. If you would like to be informed of future discounts and competitions please join my occasional newsletter (it really is only occasional!). You can sign up by putting in your details on the left hand side form or by clicking here. Thanks for deciding to get a tarot reading with me! Please fill in the details below so I can get started with your reading. You will receive a confirmation email when we have received your details. How do I pay? When you press ‘Get my Reading’ you will be taken to PayPal where you can pay with a PayPal account or by credit/debit card. Would you rather pay by card? That’s fine, after you press ‘Get my reading’, you’ll be taken to Paypal. Underneath where you would log in with your PayPal account if you had one, you will see a link that says ‘Don’t have a Paypal account?’ Simply click this and enter your details. I’m not from the UK, can I still order? Yes! We accept emails from all over the world. Simply fill in the form, and either use your paypal account or pay by card, and your bank or paypal will deal with the currency conversion. What’s Your Life Purpose? Find out Now! 7 Simple Steps On How To Be A Telepath? How Do Pet Psychics Really Work? What Questions Should I Ask In A Psychic Email Reading? 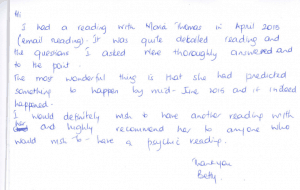 UK law requires us to say that psychic readings are for entertainment purposes and we cannot guarantee the accuracy of a reading or other service. You must be over 18 years of age to use our services. © 2019 StormJewel's Psychics. All Rights Reserved.